The Powder Coating Institute's committees work to not only shape and direct the association, but also the powder coating industry. Committee membership is exclusive to PCI Members. If you would like to join one of these committees, please sign in to your profile on the website and click on Groups to select the committee(s) you are interested in. Comprised of the Board officers, including the Past-President, sets and communicates the priorities for the committees, and reviews any budgetary concerns associated with the committee requests and activities. Our organization is growing and the involvement of the entire membership is key to our growth and our collective success. We are stronger as an organization than the individual parts in driving sustainable powder coating industry growth. Please find a place to plug in and get involved in your industry. 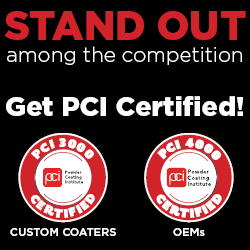 Call us at 859-525-9988 and we will help you in selecting the area where you can best invest in your own success, and at the same time, help PCI become all it can be.